As any pet owner knows, long road trips can be challenging even if your animal normally enjoys a ride. To make sure that things go as smoothly as possible, you’ll need to plan things well in advance. You might find the preparation process tiresome, but you’ll be glad that you went through it when you realize what a great time your pet has had. With that in mind, let’s list a few simple steps you can take to prepare your pet for a long ride. Pets are a lot like people, in the sense that each has a personality of its own. One might enjoy car rides, while another absolutely loathes them for whatever reason. Through some light training, you should be able to get your pet accustomed to long-distance drives. At the very least, you’ll make them easier for the animal to bear. Practice Trips: These can be a great diagnostic tool. Take your pet on a 15-minute ride around town, just to see how it goes. If they like it, you’re in luck – try it a few more times, gradually extending the duration. If the animal has a bad reaction – anxiety, nausea, etc – you’ll need to try a different tack. Cat-Specific Training: Felines dislike novelty almost as much as they dislike rumbling engines. Very few of them will ever enjoy a car ride, but some do learn to accept it. Carrier crates are usually a necessity – if you can accustom your kitty to one, you’re halfway there. Familiar blankets or other scent-bearing surfaces might serve to lure them in and get them to relax. Dog-Specific Training: Canines can withstand long drives much more easily, and they’re also easier to train. If they seem nervous after a practice ride, try to familiarize them with the car in the driveway. Standard reward/scold dynamics apply, and patience is always a virtue. Additionally, potty training can be particularly beneficial on a long ride. If your pup is able to relieve itself on command, you’ll need to take fewer stops and they won’t last as long. Leashes and Collars: Even if you don’t normally employ these, you might need them for a long ride. When the animal is exploring its new surroundings, an adjustable leash is a precaution you really can’t do without. Similarly, collars are highly recommended – especially if they have your contact information and vaccination tags listed. Containers: Smaller pets almost always travel in a container of some kind. This keeps them from bothering you while you’re driving and improves your odds of finding accommodation. Get a pet carrier of appropriate size– one in which the animal will feel snug, but not too constrained. There’s usually a choice between collapsible hard-sided crates and smaller soft-sided ones. Either way, it’s common practice to pad the container with blankets that the animal is familiar with. If your pet is too big to fit inside a crate, use a seat-belt harness to safely tether them. Favorite Toys: Any toy that the animal is used to can help relieve stress while traveling. Chewables are usually OK, though not if they’re small enough to swallow. Combined with a bumpy ride, these can present a choking hazard. Pet Food: Depending on the length of the drive, you might need to pack plenty of snacks. 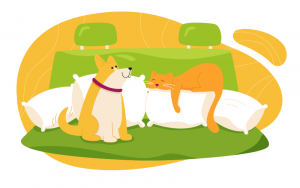 Dry pet food is usually preferable inside a car, but you can also feed the animal outside while taking a break. If there’s a particular type of food that gets your pet to take their meds, be sure to bring that. Waste Bags: All that food has to come out somehow. As any veteran pet owner knows, you can never have too many garbage bags around. To make sure that your furry little friend is in fine form, schedule an appointment with a vet. The pet’s physical is arguably the most important part of the preparation process. Since it’s more than a regular check-up, share exactly what kind of road trip you have in mind. Where you are going, how long the drive should be, who else is coming, that sort of thing. Based on that info, the vet will assess how well your pet should be able to handle the stress. Microchips: If you haven’t already, consider having the pet chipped before you hit the road. If you take them to a vet while traveling, all relevant medical info will be easily available there. And if they ever get lost, chipped pets are returned to their owners more often than unchipped ones are. Specific Issues: If your pet has a preexisting medical condition, make sure that you’re aware of any potential complications that might arise. It probably goes without saying, but you should also stock up on any medications that the animal is taking regularly. Sedatives: Even the best-behaved pet can get stressed out after a long ride. If you can’t get them to cooperate, having a mild sedative on hand can be a lifesaver. Never share your own meds, of course – use only the ones prescribed by the vet. First Aid Kit: You can get these in several varieties for different types of animals. Having a first aid kit on hand can be invaluable if your pet ends up injured while traveling. Listing Roadside Pet Clinics. Just to be on the safe side, get the contact info of pet care facilities at your destination. You probably won’t need them, but a little extra preparation won’t hurt. Long-distance driving is often stressful for everyone involved, which is why measures that mitigate the stress are essential. We hope the above advice on how to prepare your pet for a long ride will prove to be of use there. If, however, you find the pressure overwhelming at some point, there are a couple more steps you can take. Let Someone Else Take the Wheel. Let a friend or family member drive, while you spend some time with your pet in the backseat. Hanging out with animals is a great stress-reliever, and you might have the same effect on them. If you don’t have that luxury, find a reliable pet shipping service and let professionals handle the task instead.